The president of Uzbekistan has long been called, behind his back of course, “Father.” To be sure, not an “Uzbekbashi,” like the previous president of Turkmenistan was called “Turkmenbashi” (“The head of all Turkmen”) or “Yelbasy” (“The leader of nation”) like the Kazakhs call their president. 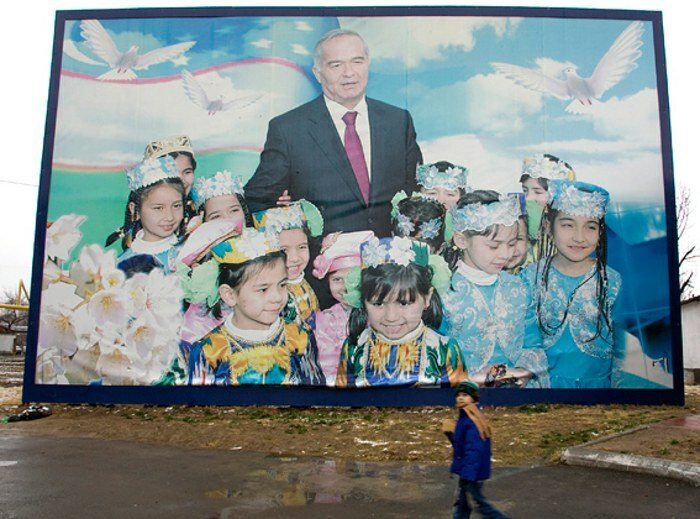 Uzbek subjects seem to feel more intimate and almost family-type ties with their head of state. It, therefore, turns out that all citizens in the country are essentially Islam Karimov’s sons and daughters. Like any father, he feeds and brings them up, punishes and forgives, and there is no way the can do without he for well over 20 years now. It is high time they grew up and start their own lives, but they just cannot bring themselves to breaking that painful dependence on almost saint father. To be fair, the daddy is not burning with the desire to open his arms and release his children. While half of the country labors away on cotton fields and the other half is laboring in foreign nations to avoid staggering poverty, Gulnara was busy building castles and TV channels, she “expropriated” successful businesses, tapped into the state budget, spent millions on shoes with diamonds, granted privileges to her favorites and punished disagreeable ones. The Forum Fund she controls has virtually replaced the ministry of culture: it now organizes large-scale national and international events, which resemble attempts of expensive personal PR-campaigns of Gulnara. The president’s daughter has herself turned into a “father” for a part of the society—artists, singers, officials, businessmen, power wielders and others, who solidified her power and gratefully ate off her table. In January 2008, the tax police literally crushed the Korean businessmen-owned Nirvana network of music and video stores; at the time, very few doubted that these chain stores would soon be revived and continue selling pirated discs. And that did indeed happen: several months later, the chain resumed business as usual, but under the protection of the PanTerra Studio, which itself is a company owned by the Terra Group—the vast show empire owned by that very same Gulnara Karimova. The Nirvana case is only one of a number of other forced overtaking cases, which Gulnara Karimova and her surrounding have widely practiced. Over several years, at the blessing of her biological and her society’s imposed “father,” she has turned into one of the most influential persons in the country, just shy of the most influential person status. If, and I certainly wish, President Karimov still has clear mind and is aware of the events rocking his country, nobody would have the guts to raise their hand on his daughter—sending the prosecutors, the police, and the tax police to her offices—unless he agreed to do so, if not ordered. It is, therefore, clear that the father gave the green light to crush the daughter’s business. And we see a familiar picture—the Nirvana network of music stores is paralyzed again. Some managers, who seem to have felt that silent threat, closed their stores. Others were sealed after the Mask Show. The Mask Show is a group of special operations servicemen, whose subordination is impossible to establish: they always wear black masks and display no insignia. The Nirvana crushing aside, Gulnara’s TV channels and radio stations were pulled off the air, too. These outlets could perhaps be equated to the “post, telegraph and telephone” of the modern life, which are to be destroyed in the first place before concurring someone. Of course, Googoosha [Gulnara Karimova’s scenic name] is absolutely not a poor and defenseless victim, as she is attempting to portray herself before followers in social networking websites. Neither is she a non-compromising defender of others’ rights and freedoms. The “Gulnara Karimova phenomenon” is just yet another case when a favorite person suddenly falls into disgrace for overreaching herself. The “father’s” wrath is a completely logical and expected continuation of his former mercy, which pampered and utterly corrupted his princess. Yesterday, Gulnara’s hand was higher. Today, her competitors are stronger: they were able to channel her father’s opinion and might for their benefit and used that unexpected luck to attempt destroying her. These very “state bodies” held their hats in hand and loyally served Gulnara. Today, they are more than delighted to see Gulnara’s business empire crash, as perhaps she was watching others’ businesses crash under her former might. 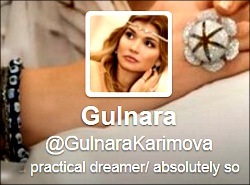 "All this [happening with Gulnara Karimova] would be amusing if it were not so sad. Was this not the exact way the Princess herself overtook others' businesses before? The wheel of history turned and, all of a sudden, it is not so pleasant [for her]. One thief is being replaced by other thieves--that's all that is there to it. And the common people, as usual, will remain outside. [I mean] literally 'outside' - beyond the Motherland's borders."